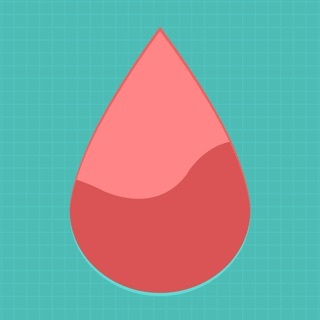 GlucoSweet is a simple diabetes management app which keeps track of your glucose readings, carbohydrate intake during meal times and medication/insulin too! - Universal app - works on the iPhone and iPad! - iCloud compatible (Sync and store your data). 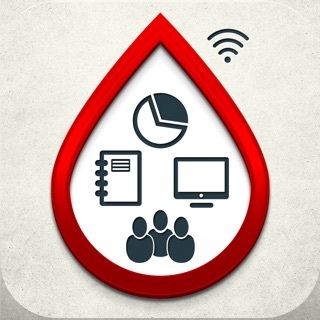 - Sync your data to your other devices running GlucoSweet on Mac and iOS. - Slick and easy to use interface. - Records unlimited blood glucose readings and carbohydrate intakes during meal times! - Supports unlimited medication/insulin intake readings too! - Automatically remembers the 'unique' medication/insulin names for efficient and effective entering for the next time around. - Graphs the readings based on day of the week and the time of the day (in both 24-hr time period as well as time of day categories) so you can narrow down which days are making your readings high or low. 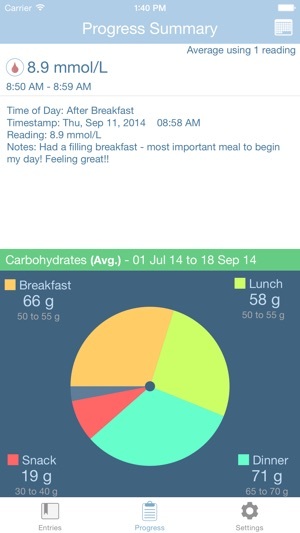 - Beautiful pie chart to keep track of carbohydrate consumption during meal times. - Ability to analyse your readings based on custom input date ranges. - Supports several entry table sorting options - choose one that suits you best! - Backup and Restore feature - keep your readings in a safe place! - Supports the iPhone 5, 6 and 6 Plus display. With an iCloud account, you have the option to store your data on iCloud. You can even sync your data to your other devices (Mac and iOS)! 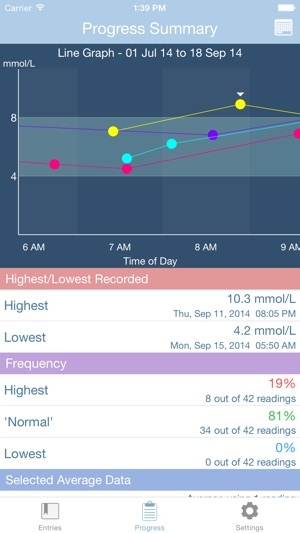 Beautiful and colourful graphs to help you keep your diabetes in control. Supports the ability to customise what you think is a suitable 'normal' range for you, which is reflected in the graph display! 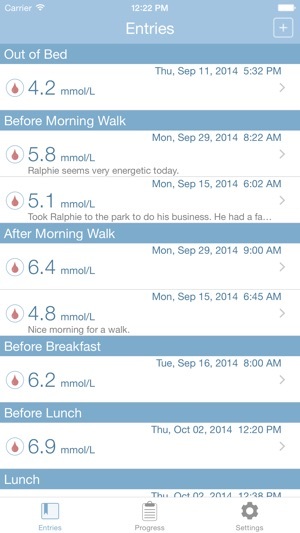 If there are any features you would like to see in GlucoSweet, please let us know. We are always happy to listen and fulfill the needs of our users. 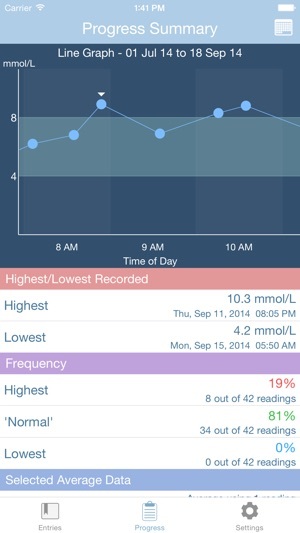 My physician recently asked me to begin monitoring my blood glucose, recording the values on paper. (Most blood glucose readers also save these values on the meter, to be downloaded at the doctor's office.) Assuming there must be an App for that, I surveyed all the ones available on the iOS and OS X App stores. Only GlucoSweet offers iCloud-synched Apps on both platforms. I was also drawn to GlucoSweet for two other reasons. First, data collection is organized precisely as my physician asked: before and after meals, and other significant events. Second, I've used another App from the same developer, Capture 365 Journal, since its first version, and have been impressed with its flawless iCloud synching, and general usefulness as a daily photo journal. Finally, the developer has proven to be extremely responsive. His responses have been useful, and to the point. I have the impression he is answering my specific question, rather than pasting boilerplate. - The numerical interface for entering values requires you to add a trailing "0" (past the decimal point) - Otherwise you wind up with "12.5" instead of "125"
Simple to use, easy to read, yet very thorough with tracking. I've been a diabetic for 47 years and this is the best system I've ever had to watch everything! 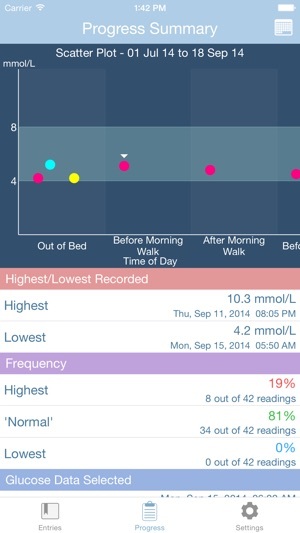 At a glance I can see blood sugars, medication dosage, times of day, and trends. I can personalize it in any way that I want to see these things and it's comfortable. Simple and intuitive!! Thank you!! © 2011-2018 Sockii Pty Ltd.